Will there be a buffet, or at-seat catering only? The chap that dived under the barrier to run onto the track, nobody seemed to be interested in the fact he left a large back pack on the ground as he ran away - to me that would / should have been an equal priority? It is, and maybe the title is therefore a bit misleading, but there is a lot going on elsewhere on the network. For example, good to see some coverage of the OHLE going up on the B&H in last night's episode. You'd like to think they were, the shot cut away after a few seconds. For someone to pick it up/start looking in it immediately might also not be the best course of action. Had to chuckle a bit at the IET driver commenting about how he always arrives early. Does GWR not get a say as to what’s shown and what is not? Next week’s program might not look to good for them. Or maybe it gives them chance to explain why there’s been a shortage of crew. Let's hope the true picture shines through. If GWR were allowed to censor it can you imagine what a dull , sycophantic programme it would be? Based on last nights episode and the ranting, almost hysterical, middle-aged lady at PAD bemoaning their lack of Customer service, one would imagine not. She was complaining about the lack of customer service, despite having just been helped through a ticketing problem and the gates by a GWR customer services assistant! I suspect that Channel 5 deliberately set out to portray this. First she gets great customer service. Then she complains about customer service. There are some people who will complain, whatever happens, because that is in their mind set. Well done Channel Five, for showing the reality of life in the front line. The ranters and ravers make for good telly. The hundreds of passengers let down by GWR on a daily basis, who are quietly resigned to their fate, don't make for good telly. They should film in the control room at Swindon, where GWR announce 5 vice 10 services. It would be a great laugh in the offices. I have seen previous film of the control room at Swindon during difficult periods and it produced sympathy for the staff working in very difficult circumstances not of their own making. I was not in the least tempted to laugh. It is easy to believe that all the staff are conspiring to make our lives as difficult as possible, but the truth is far from that. Even the examples of bad attitudes by some staff may sometimes be the result of people pushed beyond their tether. Please also remember that some staff go to unexpected levels (in one example recently discussed on this forum heroic levels) to provide good customer service in difficult circumstances. I was making a mere joke about how frequent 5 vice 10 happens and as in reality shows they watch people through cameras. I was comparing such circumstance to a fictional TV show storyline, not hard working environments. To be fair, one of the major sources of annoyance during meltdown incidents is the lack of communication between "Control" (which always strikes me as a name invented by John Le Carre) and the travelling public. 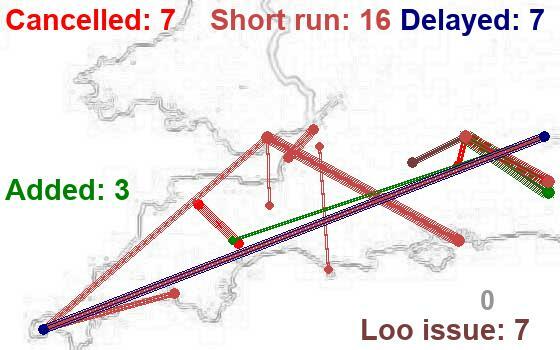 When you are stuck on a train which is going nowhere, whose train crew tell you that Control, l cannot tell them what is happening, Journey Check has a list of red "Delayeds" but no further explanation, and if you get through to the helpline 03457 000125 to be told you cannot be told what is happening because they cannot speak to Control, then sympathy for them wears thin. I appreciate that the individuals have to work in the system set up by their employer. But GWR seem to forget that they are delivering a service to their passengers, and they really should prioritorise getting information out to them. I do not tune into the Channel 5 series regularly. If I have just got home after a long day at work and an unsatisfactory journey home (especially if it has included an unwanted 25 minutes stranded in Reading because a connection has been missed), I do not have much appetite to watch this on television. However when I have caught it, a running theme seems to be various people in the system not knowing what is going on when problems occur. There does seem to be a communications problem, with Control at the heart of it. There is a challenge for GWR (or, I expect, the railway industry as a whole) to address.